"Waves sloshing." "A creak." Drest hears something. There in the sea below them where the dragon's teeth should be protecting her whole family a boat is slipping with stealth up toward the water's edge and the beach where they lie. In a matter of moments the battle is over. At her father's command Drest has run to hide as high as she can climb. Her hideout gives her a clear view of the treachery that is about to take place. The young man, the enemy, who has been left here for safety is ruthlessly shoved off the cliff to fall with finality toward the sea. As things quiet down, Drest discovers that her father and brothers have been captured, bound and gagged and are heading out to sea. The young man whose comrade had betrayed him is now her only hope. Drest is determined to find her family and free them. This stranger, this enemy, is her only hope. He can tell her where they are taking her father and brothers and he can give her the information she needs to follow, fight and free her loved ones. The journey that begins is filled with moments of desperation, legend, and the myth of her father, the Mad Wolf. It seems he is known for brutality, treachery and violence. Town after town is filled with people who despise him. This is not the father Drest knows. Intrigue, betrayal and determination are brewing in a world where witches wield small power, a sword can produce some justice, and a lesson about the power of words awaits. Can she do it? Can she save the men whose voices and teachings fill her mind even in her darkest moments? A story brimming with girl power and the smells and truths of the past unfolds with ferocious pacing and relationships that teeter while they grow. Friendship, loyalty and grit win the day. Wonderful adventure and a treat for anyone who is claimed by the medieval days of Scotland. 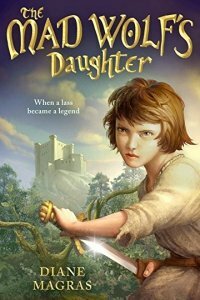 A Scottish medieval adventure about the youngest in a war-band who must free her family from a castle prison after knights attack her home--with all the excitement of Ranger's Apprentice and perfect for fans of heroines like Alanna from The Song of the Lioness series. One dark night, Drest's sheltered life on a remote Scottish headland is shattered when invading knights capture her family, but leave Drest behind. Her father, the Mad Wolf of the North, and her beloved brothers are a fearsome war-band, but now Drest is the only one who can save them. So she starts off on a wild rescue attempt, taking a wounded invader along as a hostage. Hunted by a bandit with a dark link to her family's past, aided by a witch whom she rescues from the stake, Drest travels through unwelcoming villages, desolate forests, and haunted towns. Every time she faces a challenge, her five brothers speak to her in her mind about courage and her role in the war-band. But on her journey, Drest learns that the war-band is legendary for terrorizing the land. If she frees them, they'll not hesitate to hurt the gentle knight who's become her friend.